Edgard Hernández a five years old child in La Gloria, Texas, is the first docummented case, or "patient zero" of swine flu in the United States, the acting director of the Centers for Disease Control and Prevention said Wednesday. "I can confirm the very sad news out of Texas that a child has died of the H1N1 virus," the CDC's Dr. Richard Besser said. As confirmed cases of swine flu have risen to at least 112, health officials think they may have found "patient zero" in the global outbreak -- in a small village in the mountains of Mexico. 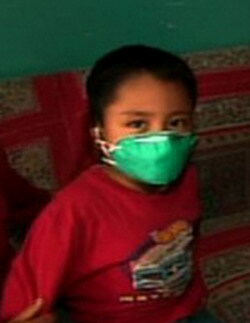 Five-year-old Edgar Hernandez survived the earliest documented case of swine flu in an outbreak that has now spread across four continents. Edgard's family lives in the 3,000-person village in the state of Veracruz, where a flu outbreak was reported on April 2. State officials arrived and took samples from dozens of people. Lab tests confirmed that Edgar was the only patient in Veracruz to test positive for the swine flu virus; the others had contracted a common flu. Health officials had returned to Edgar's sample only after cases of the new flu strain were spotted around the country. "In this case, there's a patient who turned out to be positive for the swine-flu virus, with the exception that at that time in no region of the world it had been established as an etiological, epidemic cause," said Mexico Health Secretary Jose Angel Cordova. Edgar has managed to bounce back from his symptoms and is asking for ice cream for helping him feel better. Mexican health officials suspect the swine flu outbreak has caused at least 159 deaths and roughly 2,500 illnesses. On Wednesday at least 112 cases has been confirmed by the WHO in the whole world, this list does not include 11 cases reported by New Zealand, three by Germany or another confirmed by Costa Rica.